MALAYSIA’S Social Security Organisation (Socso), which has a fund size of about RM26 billion, expects to start making private equity (PE) investments from next year, having obtained the government’s nod to delve into that asset class. “Socso was given the approval to participate in PE investment as an asset class early this year,” its CEO Datuk Dr Mohammed Azman Aziz Mohammed tells The Edge via email, confirming market talk that the fund had finally obtained regulatory approval. 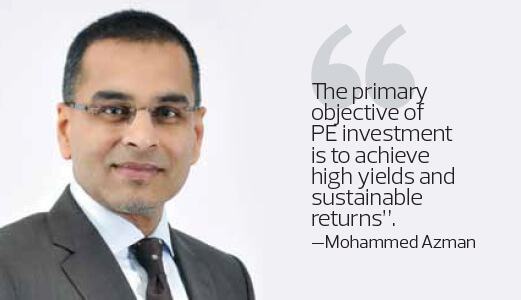 The move into PE, part of Socso’s asset diversification strategy, is expected to help it achieve better and more sustainable returns over the long term. It currently invests only in fixed income, equities, money market instruments and property. Mohammed Azman said Socso’s participation in PE would be through direct investment in PE companies — in other words, acquiring a stake in them — and investment in PE funds that are managed by professional fund managers with a strong track record. He did not state whether Socso would be limited to taking stakes only in local PE companies. “Direct investment in a PE company gives greater control and return potential, but requires more time management and close monitoring. Socso will take this route if the business/project is in line with Socso’s core business or any sector related to its core business,” he says. “Investment in PE funds will allow Socso to benefit from diversification, either sectoral or geographical, even with small capital commitment. Diversified PE investment ensures better risk-adjusted returns compared to single property investments,” he adds. Socso recently developed a five-year investment strategy blueprint that outlines the implementation strategy of each asset class, with the ultimate aim of achieving higher long-term returns of between 5% and 6% annually until 2022. “Based on the current investment strategy blueprint, we have allocated funding for PE investment for the next five years but the actual utilisation is based on various factors. Given the complexity in the [PE investment] processes, if Socso were to invest in any PE investment, it will very likely be sometime in 2018,” Mohammed Azman says. The bulk of Socso’s RM26 billion fund currently, or 56%, is invested in fixed income, followed by money market instruments (22%), equities (20%) and real estate (2%). Its foreign investment exposure is only about 4%, all of which is in equities, Mohammad Azman says. “The current and expected return on the total fund is between 5% and 6%,” he says. Socso’s 2015 annual report shows that the fund made a 4.89% return that year, down from 7.96% in 2014. (Socso has yet to publicly release its 2016 annual report). It is understood that the return was higher than usual in 2014 because Socso realised gains in equities, having taken advantage of the bullish market. Socso is a government agency that was set up to provide social security protection to Malaysian employees. It runs two social security schemes — the Employment Injury Scheme and the Invalidity Scheme — that provide cash payments and benefits in kind to employees and their dependents in the event of a contingency. Its two main sources of income are the contributions of its members and the returns on its investments. They accounted for 71.5% and 27.6%, respectively, of its income in FY2015. Socso needs to improve its income, given that its compensation payment to members is increasing at a faster rate compared with 10 years ago. To keep up with its growing liabilities, it needs to generate better investment returns. “The primary objective of PE investment is to achieve high yields and sustainable returns. Thus, the focus is on stable investments based on the guiding principles (deal scope, size, risk appetite, and alignment with Socso’s investment strategy), strategic boundaries (sectoral analysis), and financial boundaries (minimum hurdle rate). Other [investment] parameters are market and company attractiveness, growth opportunities, value drivers, management capabilities and financial health,” Mohammed Azman says. Globally, an increasing number of pension and government-linked investment funds have been jumping onto the PE bandwagon as the challenge of getting good returns grows. Two months ago, the Employees Provident Fund said it aimed to increase its investment exposure in private assets — including infrastructure, property and PE — to 15% of its total assets under management from 5% currently. EPF’s fund size stood at RM73.1 billion as at end-2016. In comparison, Socso’s stood at RM24.68 billion, which it has grown to about RM26 billion now. Consulting firm Bain & Co’s latest report on PE in Southeast Asia (SEA) shows that the region offers ample opportunities to earn high returns. “After a subdued 2015, PE deal value in SEA bounced back to US$6.8 billion in 2016 — up from just US$4.8 billion — 14% higher than the 2011-2015 historical average. A rebound in Malaysia from a record low in 2015 helped spur the rally,” it says in the report released in April. Interest in the internet sector was strong, accounting for a quarter of the region’s total deal value last year. According to Bain & Co, the region’s deal market remained driven by Singapore, Indonesia and Malaysia. Collectively, they accounted for over 80% of the region’s deal value from 2012 to 2016.